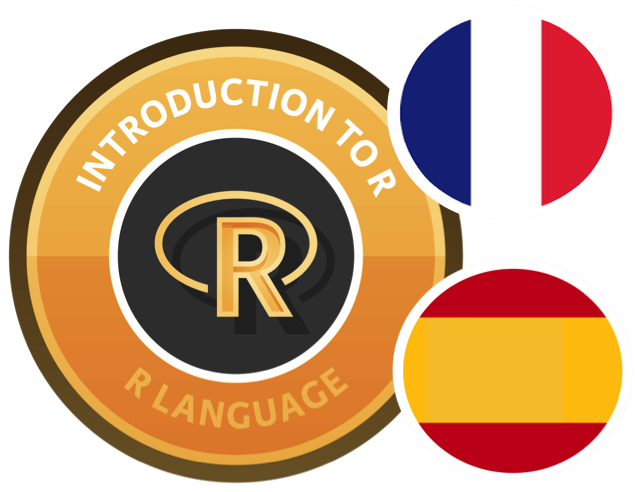 The team here at DataCamp is thrilled to announce that we now offer free Spanish and French translations of our most popular course, Introduction to R. Best of all, the courses are free as a part of our open course offering! By using in-browser coding challenges you will experiment with the different aspects of the R language in real time, and you will receive instant and personalized feedback that guides you to the solution. All of this, now available in Introducción a R and Introduction à R! This free introduction to R tutorial will help you master the basics of R. In six sections, you will cover its basic syntax, preparing you to undertake your own first data analysis using R. Starting from variables and basic operations, you will learn how to handle data structures such as vectors, matrices, lists and data frames. No prior knowledge in programming or data science is required. In general, the focus is on actively understanding how to code your way through interesting data science tasks. Want to create your own translation of Introduction to R? With DataCamp Teach, you can easily create and host your own interactive courses for free. Use the same system DataCamp course creators use to develop their courses, and share your R knowledge with the rest of the world. With DataCamp teach you just write your interactive exercises in simple markdown files, and DataCamp teach uploads the content to DataCamp for you. This makes creating a DataCamp course hassle-free.